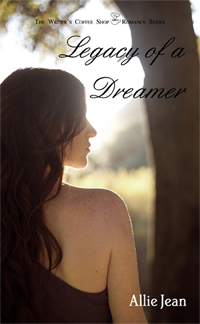 Legacy of a Dreamer was the first book I’ve read by Allie Jean. Looking back now I’m so glad that I did! This is a book I will read over and over. While reading Legacy of a Dreamer, I was taken to another world where I was always on the edge. Allie Jean has a way of writing that just flows and keeps you interested. She knows when and where to reveal a secret or add action to the scene. She also makes you fall in love with the characters. Chantal had finally found her freedom, only to find she had to start running for her life. Chantal is a such a strong character. The readers can relate to her. Although she has had a rough life, she knows what it takes and keeps going. Both sides of Chantal showed through though. One minute she was strong and stood up to fight, while the next she about to have a breakdown. This makes her more realistic because anyone in her situation would do the same thing. Nick/Mathias was a very deep character that made you love him. His softer side came through only when he was with Chantal. Their romance was well played out; although, I found myself wishing their relationship would take form faster, like I do in every romance. I just love Chantal’s and Nick/Mathias’ relationship. It’s fun to watch their characters grow. Chantal Breelan is a ward of the state, living under the care of a woman who is cold and heartless. Her past is a mystery, and her future is even more uncertain. She can’t recall why she had been taken from her parents and so she’s left with nothing but an empty hole where her childhood should have been. When she awakens from her nightmares, she’s left with terrible, violent images, as well as a boy whose face is oddly familiar, yet can’t be placed.Scared and alone, Chantal begins to confide in an imaginary friend – a shadow in the shape of a man who stands in the corner of her room. She is comforted when she believes he listens to her.On her eighteenth birthday, Chantal is forced to leave her foster home. She moves to New York City, but the start of her new life doesn’t begin as smoothly as she’d hoped. In this environment, she faces a whole new set of challenges.One night at a subway station, Chantal meets a young boy who runs away from her, and she’s compelled to follow him down into the tunnels. But this Rabbit Hole reveals a world where reality is a nightmare. Her dreams are clues to her future, and her life becomes twisted and dangerous when she learns that things that go bump in the night are not just in fairy tales and childhood stories. You can find Legacy of a Dreamer on Amazon, Barnes and Noble, or from The Writer’s Coffee Shop. Allie Jean was born with an overactive imagination. At a very early age, a child, her days were spent inventing stories, directing her sisters in made-up plays or telling elaborate ghost stories. Her mind never took breaks, or shutdown, even when she slept. When her eyes shut at night, she would have vivid dreams complete with extensive, elaborate plot lines, and good overcoming evil villains. She was encouraged by her parents, even at a young age, to write down her tales, and it has remained a somewhat secret hobby. It became a means to escape from the drama of real life into one of the many worlds she created. Follow Allie Jean on Twitter and Goodreads. This entry was posted in Guest Review, Uncategorized and tagged allie jean, book review, discover new books, guest review, legacy of a dream, novel review, rachael clipson, reading.